Enduring through dust and fire, the Washburn A Mill has represented the heart and soul of Minneapolis for over 140 years. Rail lines delivered grain from the vast western plains to the mill. St. Anthony Falls, which had long powered the sawmills of the lumber industry, began driving turbines for the flour mills, too. Trains traveling north to Duluth's port and east to the nation's major population centers carried the milled flour to market. An influx of immigrants provided the labor. It was a recipe for success. But in May 1878, just four years after opening, a spark ignited airborne flour dust, creating an explosion that claimed 18 lives, leveled the mill, and destroyed much of the riverfront business area. 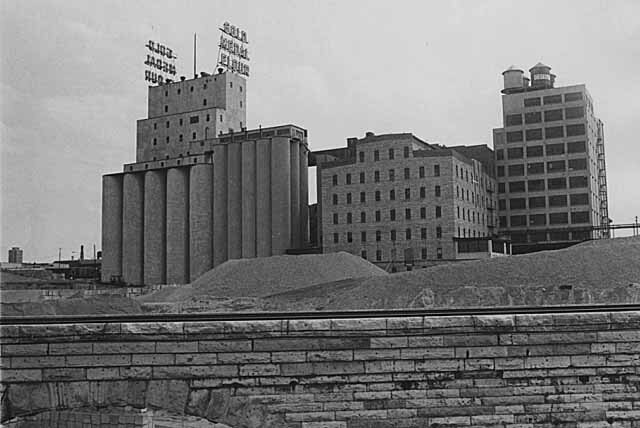 Minneapolis’s milling capacity was cut in half. Washburn would not let such a disaster strike again. He called upon Austrian engineer William de la Barre to install ventilation systems and dust collectors that would prevent the build-up of combustible flour dust. De la Barre brought with him a sketch of a state-of-the-art mill in Budapest to use as the basis for the new mill’s design. The new plans called for a vertical construction several stories high, with exterior limestone walls four feet thick at the base and tapering off as the building rose. Each floor was dedicated to a different purpose, using gravity to transport the product from one floor to the next. New automatic steel rollers replaced traditional millstones, making it possible to produce higher volumes of flour with greater uniformity. Each floor was dedicated to a different purpose, using gravity to transport the product from one floor to the next. New automatic steel rollers replaced traditional millstones, making it possible to produce higher volumes of flour with greater uniformity. The new Washburn A Mill was completed in 1880, just two years after the explosion. With a design imported from eastern Europe, and machinery that made for both safer operations and higher quality flour, the new mill was the largest and most technologically advanced mill in the world. It was the first time flour milling was industrialized at this scale in the United States. The mill operated smoothly until 1928, when an equipment malfunction caused a fire to break out, gutting the mostly wooden interior of the building. After the smoke and debris cleared, new concrete pillars and flooring were installed that would prevent the spread of fire should it occur again. Flour production would continue for another 35 years. By the 1960s, changes in transportation rates, tariff rates, and energy technology led the industry to move out of Minneapolis, and the old mills fell into disuse. The Washburn A Mill closed in 1965. Though the Washburn A Mill was added to the National Register of Historic Places in 1971 and named a National Historic Landmark in 1983, it sat vacant except for occasional tenants, curiosity seekers, and homeless people seeking shelter. In February 1991, fire struck once again. Because the neighborhood was still largely vacant at the time, emergency responders weren’t notified until the flames had engulfed the building. By then, all that was left of the old mill were the concrete of the interior and crumbling limestone walls. But rather than demolish the remains, the city cleared the rubble and reinforced the mill's damaged walls. Shortly thereafter, the Minnesota Historical Society announced its plan to develop a museum on the site. Mill City Museum opened in September 2003. 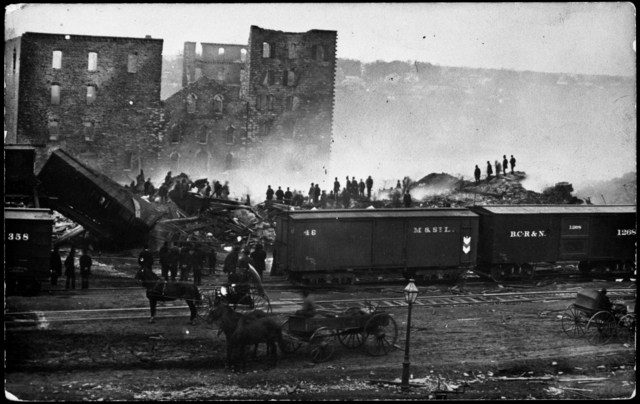 In a matter of seconds, a series of thunderous explosions — heard 10 miles away in St. Paul — destroyed what had been Minneapolis' largest industrial building, and the largest mill in the world, along with several adjacent flour mills. It was the worst disaster of its type in the city's history, prompting major safety upgrades in future mill developments. Washburn A Mill after the 1878 explosion. Washburn A Mill after the 1878 explosion. Source: MNHS Collections. Washburn A Mill, 1880. 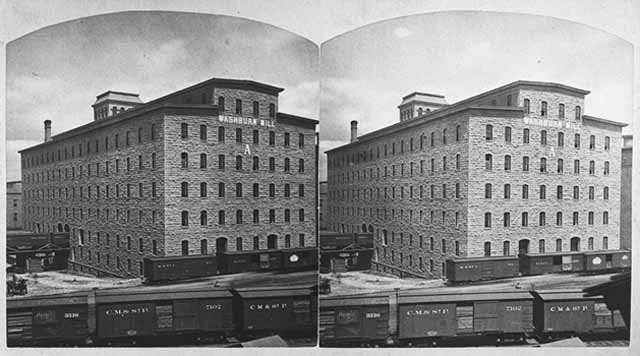 Washburn A Mill, 1880.Source: MNHS Collections. Washburn A Mill Complex during the years of peak production. 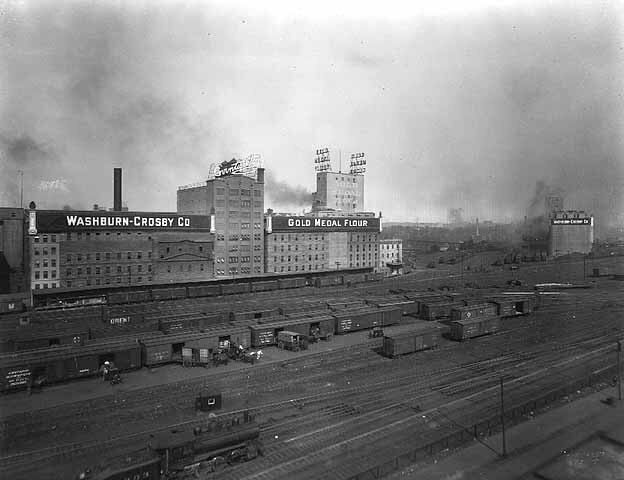 Washburn A Mill Complex at its peak.Source: MNHS Collections. Abandoned Washburn A Mill, 1976. Abandoned Washburn A Mill, 1976. Source: MNHS Collections. 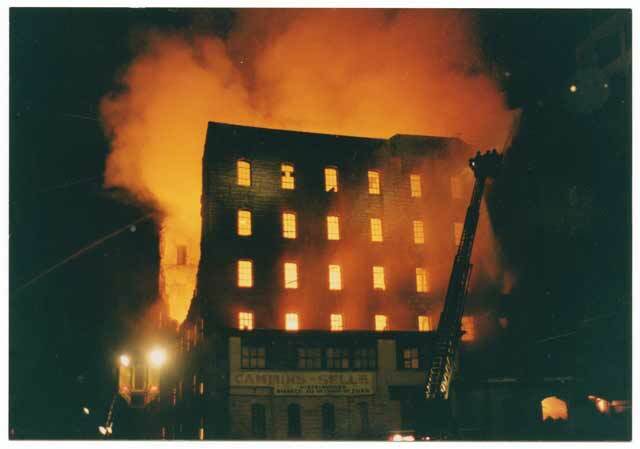 Washburn A Mill fire, February 1991. Washburn A Mill fire, February 1991. Source: MNHS Collections. See more photos of the 1991 fire.